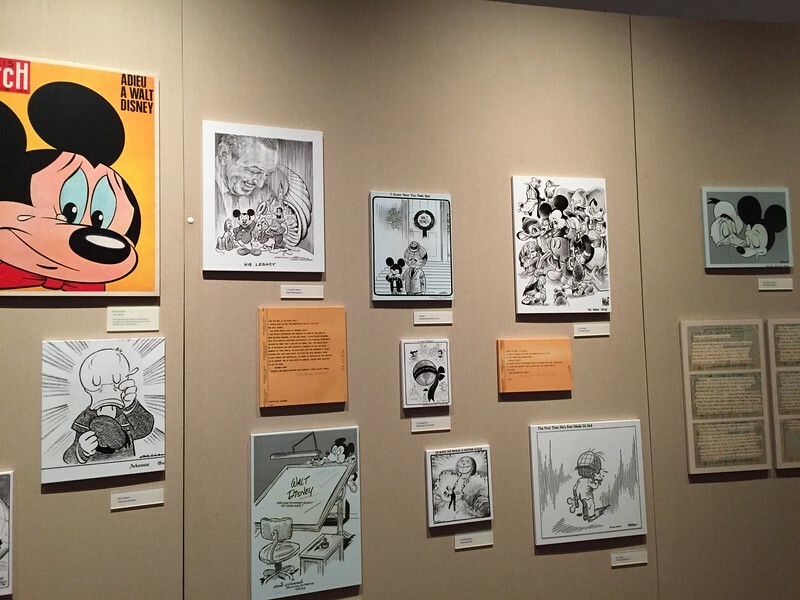 Discussion in 'Disney Trip Reports' started by Steppesister, Aug 13, 2018. Poolrat I am alive, sometimes I wonder too. I don't believe it for a minute! As a fellow over 50 (almost 53!) I have decided we are aging like fine wine......right???? Holy cow... so much behindedness. In addition to the sort due to a pathetic lack of dieting self-discipline. Work weeks are suckingly long. And weekends have their own sets of issues and stuff to do. But, I'm caught up as much as I could on the threads I follow (I apologize for my sadly abbreviated comments lately) and am now poised to spend tomorrow replying and writing new updates. YAY!!! Bear with me, Friendlies! Now... how do I make warm chocolate chip cookies show up at my door? Finally! An excursion to plunk another something into the Bucket List Bucket. Sit back with a nice cup of coffee. Or a martini. Or a Coke for all I care. Maybe today a cold glass of milk would be best since I just baked some choco chip cookies. Grab one as you find your spot on the couch (mind my bubble); they’re still nice and warm and gooey. Mmmm…. I made brownies.... but I see you finally made them. I have all the ingredients, I just didn't want to get off the couch for that long. Can't somebody just knock and hand them to me? I'm curious.... how many of you, My Dear Readers, have actually ridden the Astro Orbiter? I have I have!!! However one time I remember being freaked out over the height and the tilt. More so the tilt! Yes the line usually prevents me from going again. Because I'm craving it too. Good Lord, those are amazing! I had one last time. They are good! 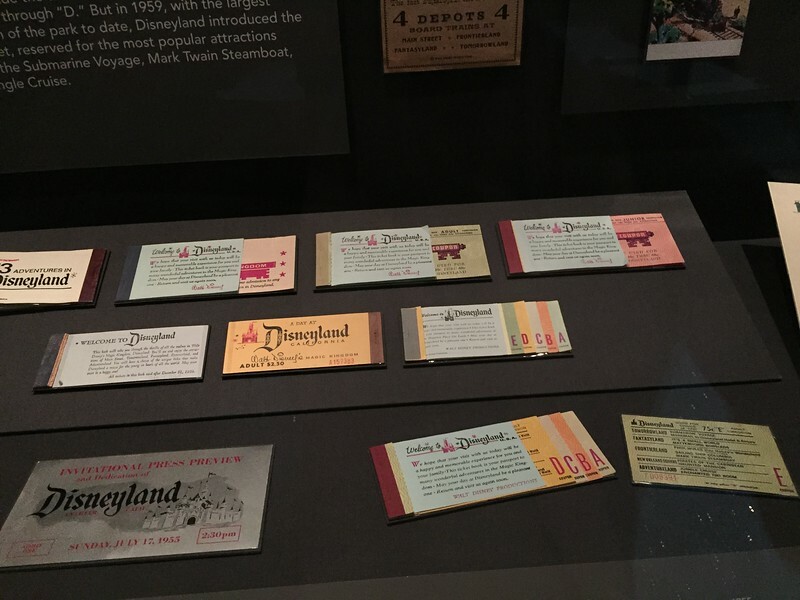 The general layout is chronological and goes from Walt’s childhood through his death hitting all the major eras of his life and career including the phases of his companies. However, the first “room” is an outlier. 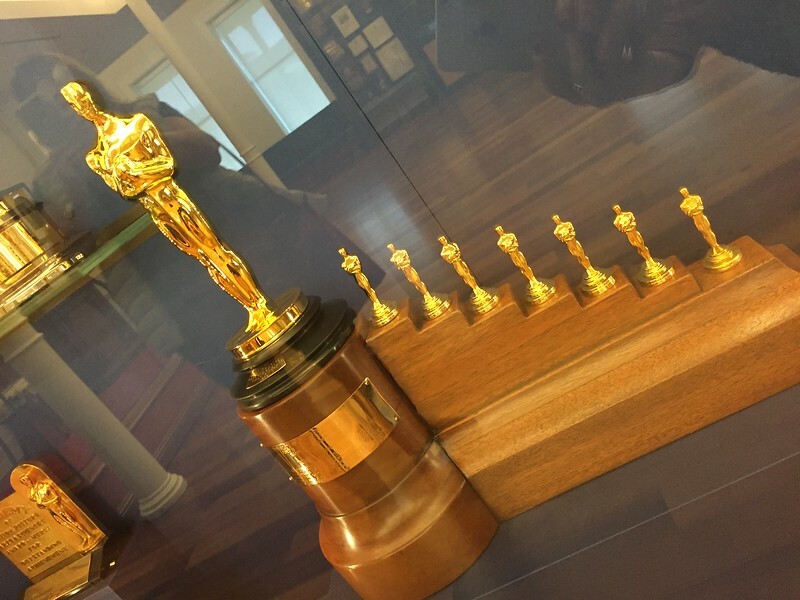 It houses the many, many awards, medals, honors, and certificates of membership that Walt or the company received. He was a member of countless foreign government honor societies, service clubs, and emeritus at universities all over the world. Nice way to start the tour. 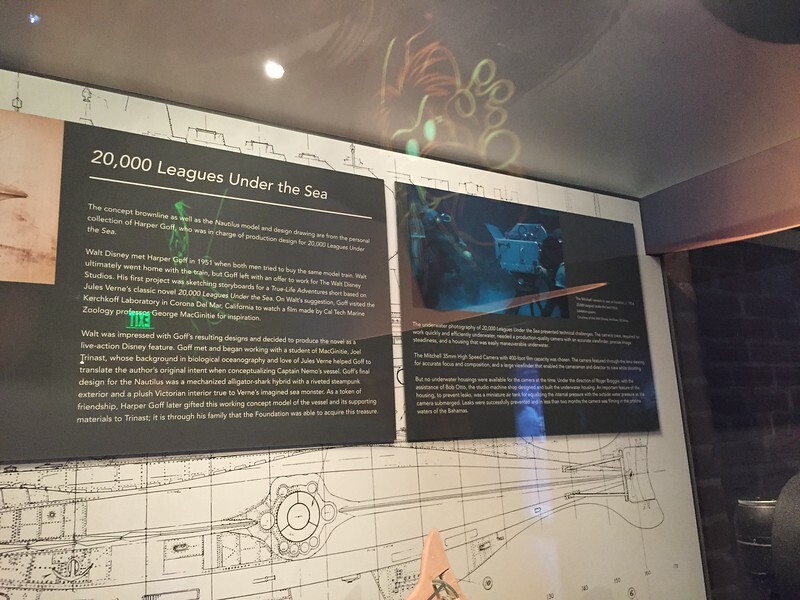 Again, there was just massive amounts of information and displays. There is no way to tell you everything. Along the way there are “telephones” you could pick up to hear firsthand accounts of people’s perspectives on this or that. One of my favorites was of several women talking about what they thought it was like working in the paint department after the Studios in Burbank were built. Tucked away in one corner was something VERY ummm.... things that make you go "hmmm?". Almost hidden away, and for obvious reason, was a very small poster of… brace yourself… Pin-ups for Servicemen done by Disney artists. Completely condoned and sponsored there were drawing of nudes (almost completely mind you)/pin-ups. I won’t post them here, as I don’t want to get busted but will happily show you if you PM me. I was blown away. 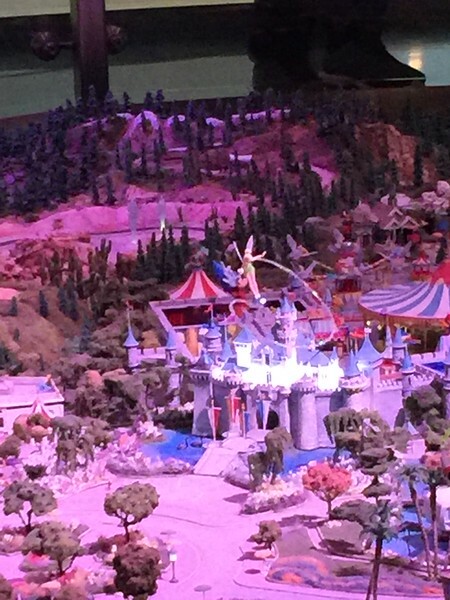 One of the neatest displays was this huge model of Disneyland, although, as the curator who stood CAREFUL guard over it pointed out, it was not a model of the park at any one point in time. It was a conglomeration of the park at various points in time throughout the years in an idealized state. I bet that guard was there to keep the "touchers" away. 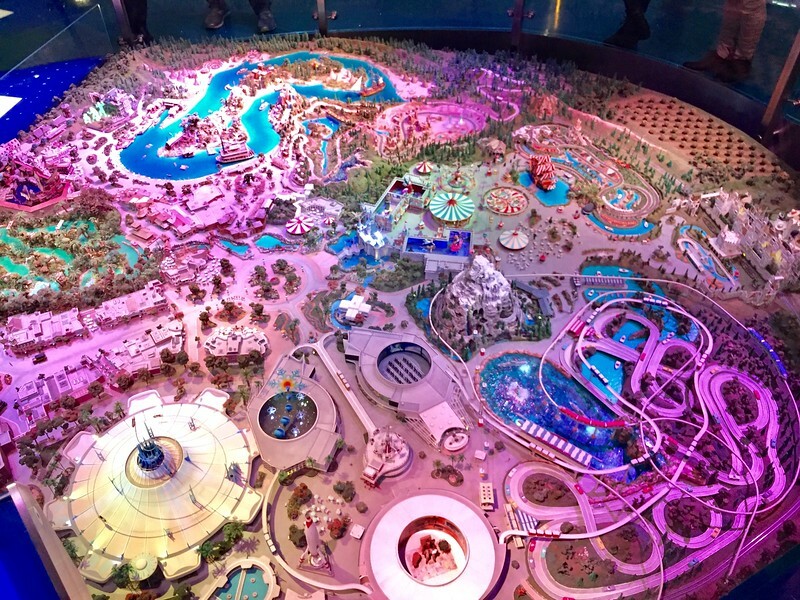 A neat concept of the park. 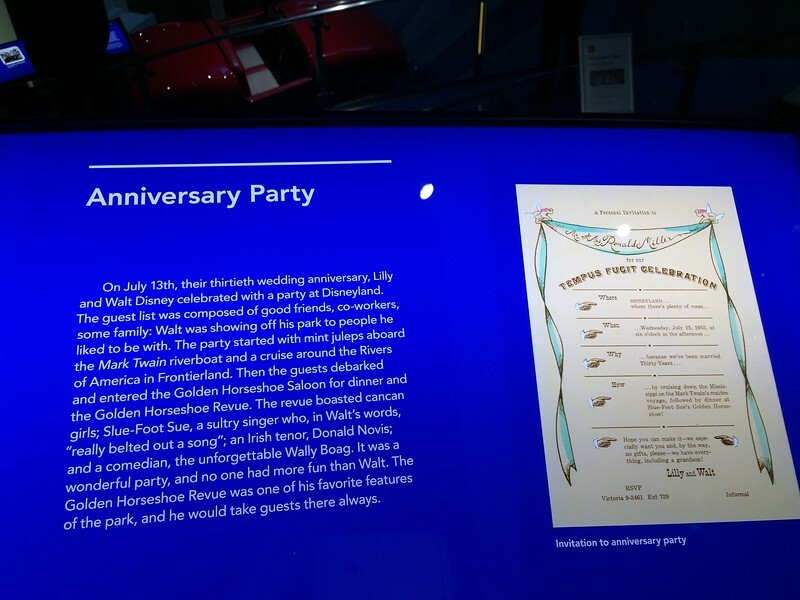 For their 30th anniversary, Walt threw a bash in the Golden Horseshoe (complete with the taboo booze no less! LOL!) I loved the invitation. So much for Walt not wanting booze in the park! WEll not for the general public. I guess he did't like the "idea" of booze in the park. All good things must come to and end, as they say, and I found myself shedding a tear or two along with Mickey and Donald as we said good bye to Walt. A pioneer, innovator, artist, businessman, patriot, father and husband. The world loved him (except those who could have made more money off their acreage in the Florida swamp). Lovely tour of the museum. Now to work this museum in to a yet unplanned and unfinanced trip. I'd actually like to do border to border. North to south or south to north doesn't really matter too much. Maybe next year? Ah! So you could afford either a drink or a concert. With Rowan Atkinson, how could it miss? He is so dang funny. I could watch Mr. Bean all day and still be laughing at the end. It doesn't get any fresher than that!!! Mmm, it was soooo good. Maybe less offense and more smiles and finding commonality. Perhaps just as interesting a concept. I don't know what this is referring to? I can see that. I just want to soak it all in. Fitting in a challenge like that would be... well... challenging. And yet, I"ve found that my various challenges have in some very real ways helped me to soak in a lot MORE of the parks. They've gotten me to see and look for...more. One must have new games to play. Perfect! I like that you did a double "P" there. I was kinda wondering there for a bit. I saw the photo before I read that... and thought, "Wow! Steppsister has really hairy arms!" I have been accused of having hairy toes in my distant DISPast. Hairy arms no. Quite right. It's only appropriate that a queen gets her due in your hunt. Of course!! From one queen to another, you know. I find Snow goes away every year in Spring. Unless you're in Canada, then it's Summer. Not I. And don't have any intention of doing so. OH? Which one is that? Ta-da! Unless that should be ta-ta. Er... no that won't quite do. Yay! That's what makes going even more worthwhile! It was sooooo good on a hot day! And they were/are delicious. And it being just lil 'ol me, I froze 2/3 of the dough for more cookie evenings. Yes!! It's the tilt!! I swear I felt like I was going to fall out last time I rode it! It was a bit surprising to come around the corner and see that after being it the closed up building for so long. Absolutely she was. And had to tell more than one or two to back up a bit. Cameras weren't allowed past the railing. LOL! I found it rather ironic as well. It's a long way for you guys... I get that. 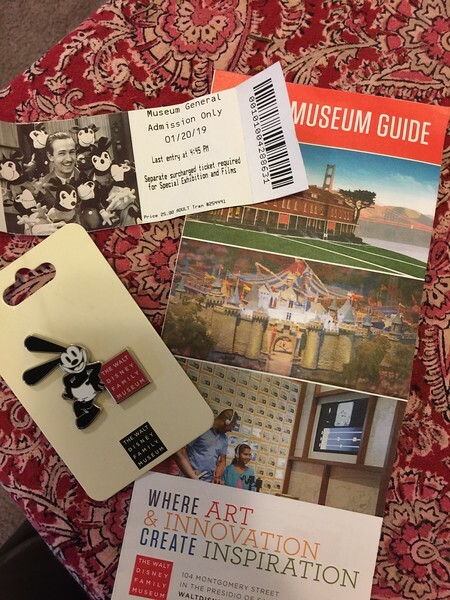 I cannot wait to visit The Walt Disney Family Museum myself, it looks so amazing. I confess, I kind of skimmed over some of your details because I don't want to spoil it and see everything before I get to go. It looks like a nice area to spend some time in. How long did you stay in San Francisco? I loved the various cells on display and watching the clips of this or that being made. 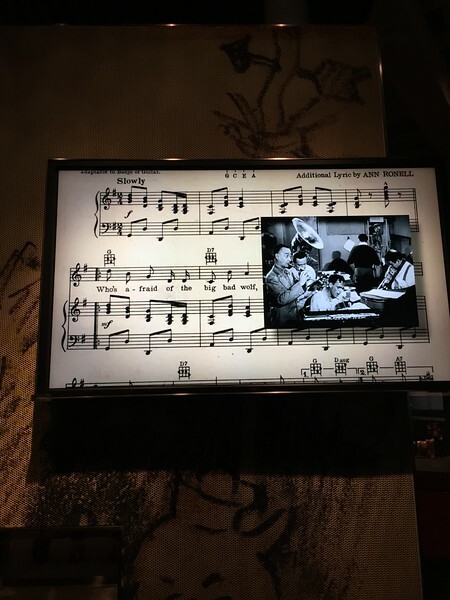 Another interesting part was the process of adding music or soundtrack to animation. Walt was an innovator in this. Another entire room was dedicated to “The Difficult Years”. 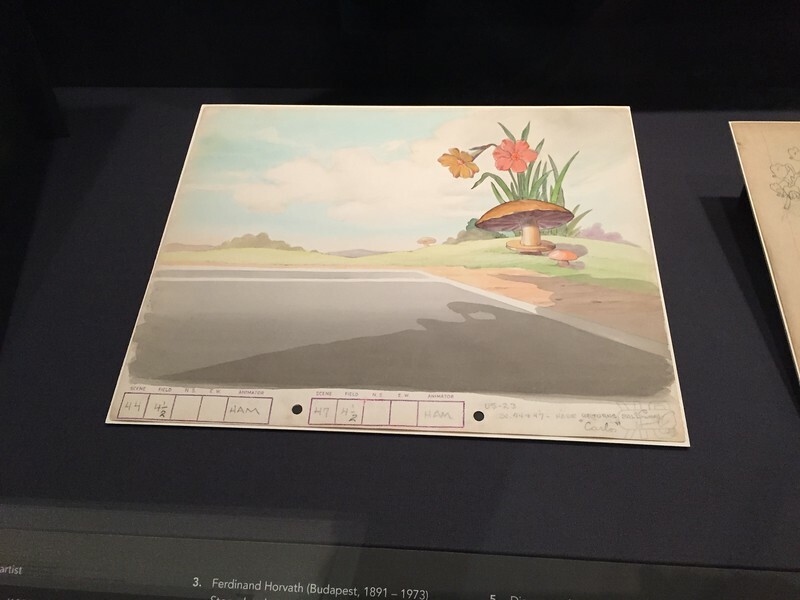 At one point, Walt Disney Co. ran into trouble with the Animator’s Union and his artists went on strike. Another was during WWII. 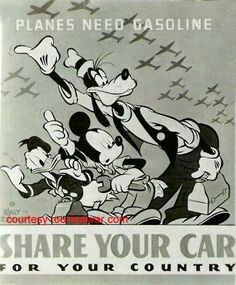 There were massive rations of everything and Walt, being an incredibly patriotic man was heavily involved in war efforts. But he also got embroiled in testifying to Congress about Communist infiltrations among the Hollywood folk. I didn’t spend a lot of time in this area as time was starting to grow short on our visit, but it was very interesting. Tucked away in one corner was something VERY ummm.... things that make you go "hmmm?". Almost hidden away, and for obvious reason, was a very small poster of… brace yourself… Pin-ups for Servicemen done by Disney artists. Completely condoned and sponsored there were drawing of nudes (almost completely mind you)/pin-ups. I won’t post them here, as I don’t want to get busted but will happily show you if you PM me. I was blown away. 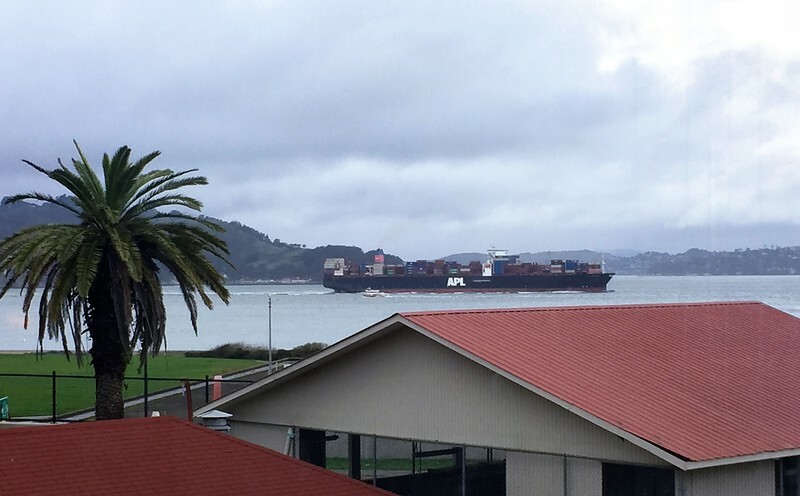 We were just in time to see a cargo ship just passing under the bridge. Pretty cool! 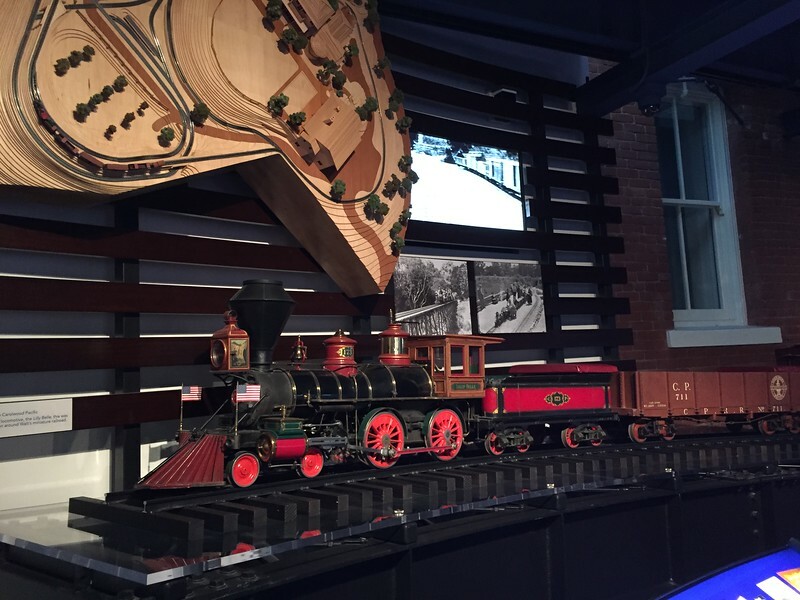 The first exhibit is of Walt’s love of trains along with THE Carolwood Pacific. 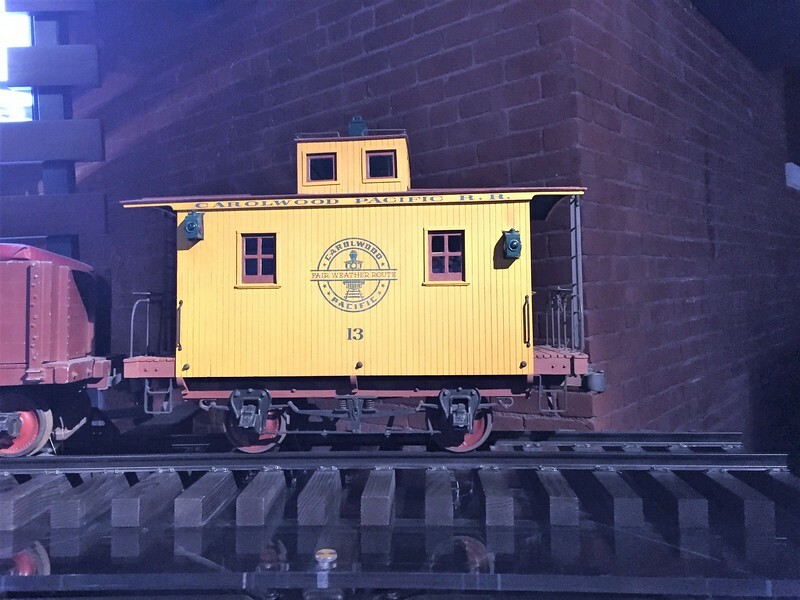 The caboose is extra special because Walt hand built it himself at the Studio’s workshop. As a sidenote, I also found it interesting that Walt also loved horses and playing polo. He also loved skiing, collecting miniatures, and doting on his daughters. 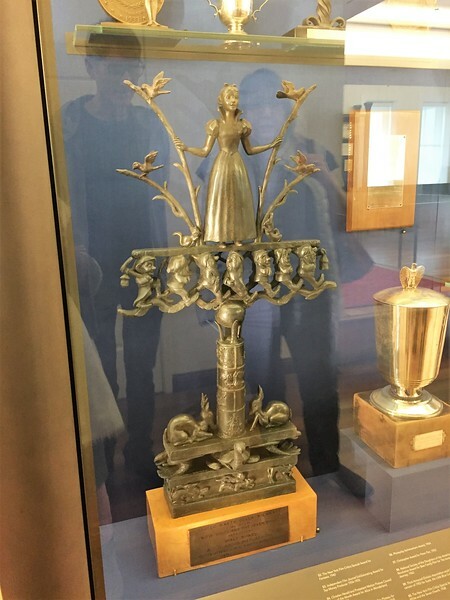 There was a nice collection of trinkets and gifts he’d given to his girls or Lillian throughout the years as well as some of his dollhouses. 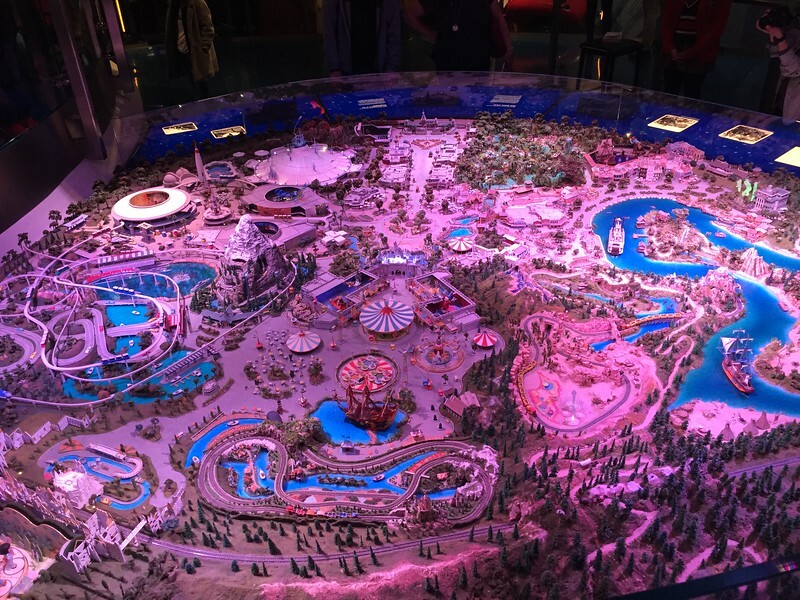 One of the neatest displays was this huge model of Disneyland, although, as the curator who stood CAREFUL guard over it pointed out, it was not a model of the park at any one point in time. It was a conglomeration of the park at various points in time throughout the years in an idealized state. It was fun to take a mental stroll through it which brought up memories of park visits all along my childhood continuum- from my earliest memories of going with my grandma to my Grad Night, to working there as a CM. Somewhere in that room was also a huge display of Mickey Mouse Club stuff and photos, as well as collectibles of all sorts. 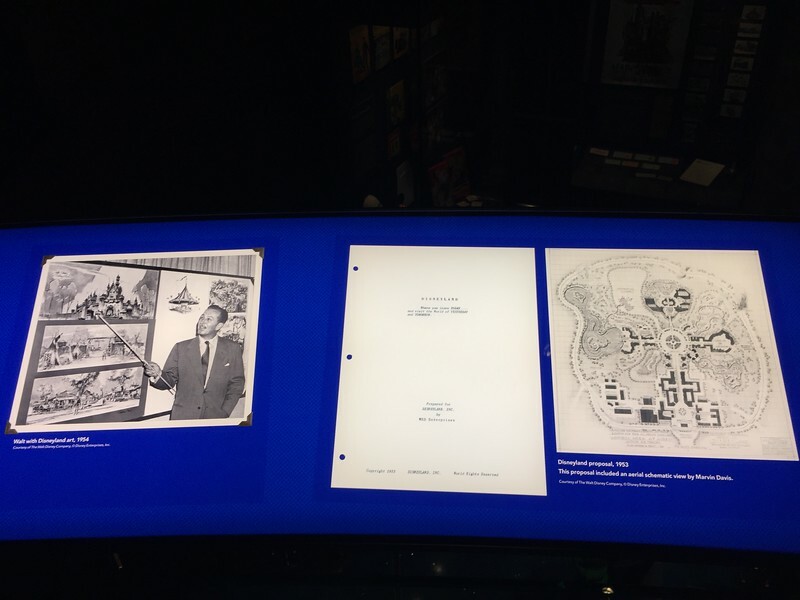 There were also several exhibits of Walt's other projects including EPCOT, and the ski resort he tried to get up and running, but it never took off. 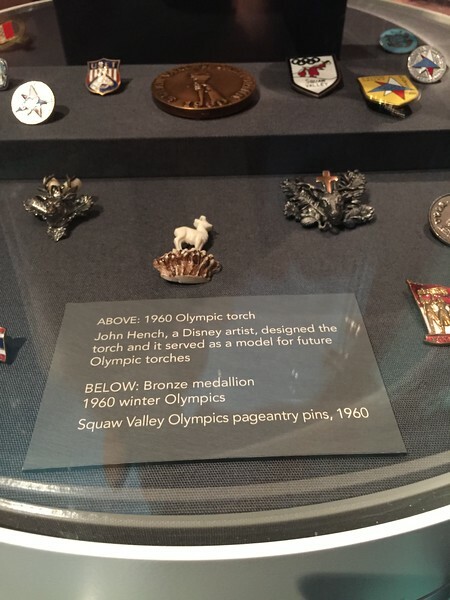 BUT, did you know that Disney artists did design a torch to be carried in the 1960 Olympics in Squaw Valley that all subsequent torches are based on now? To sum up, I really enjoyed the entire museum. 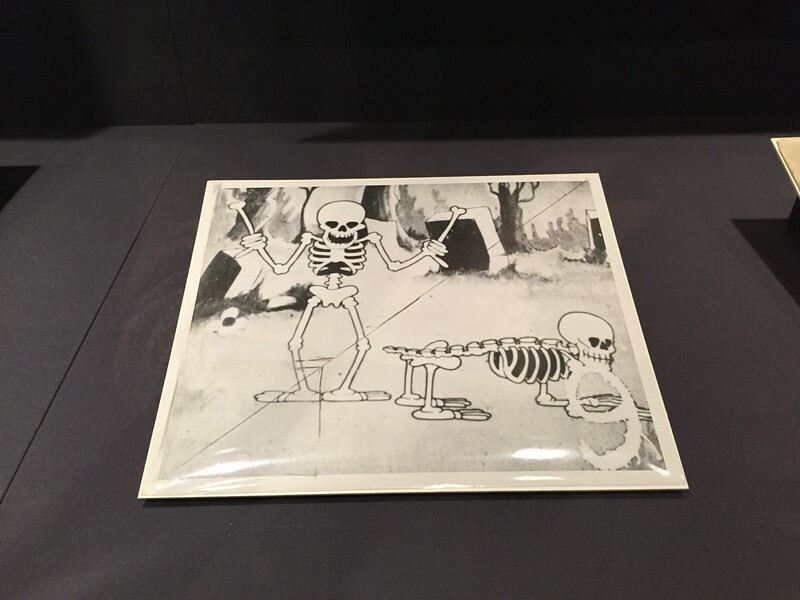 It was well laid out, had incredible exhibits with enough variety in the formats to keep you engaged, was highly interactive, and reasonably priced. Breaking with Disney mandate, you do not get dumped into the gift shop, but I did go in. The bathroom was on the other side. 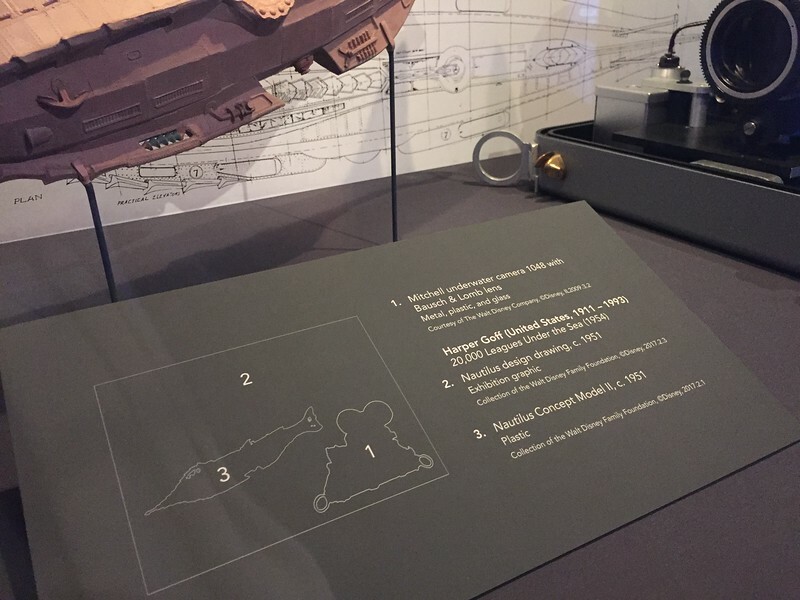 Cool move, Disney Family Museum, cool move. I bought a pin for $13. So Disney-priced. There is also a café which had reasonably priced meals and snacks. We were heading straight to dinner, so we didn’t partake. Would I go back? For sure. And probably will someday. Until then, I hope some of you will get to. It was well worth the time and money. First, fantastic photos as usual. To be honest, I've become so accustomed to the high caliber, I kinda expect it now. 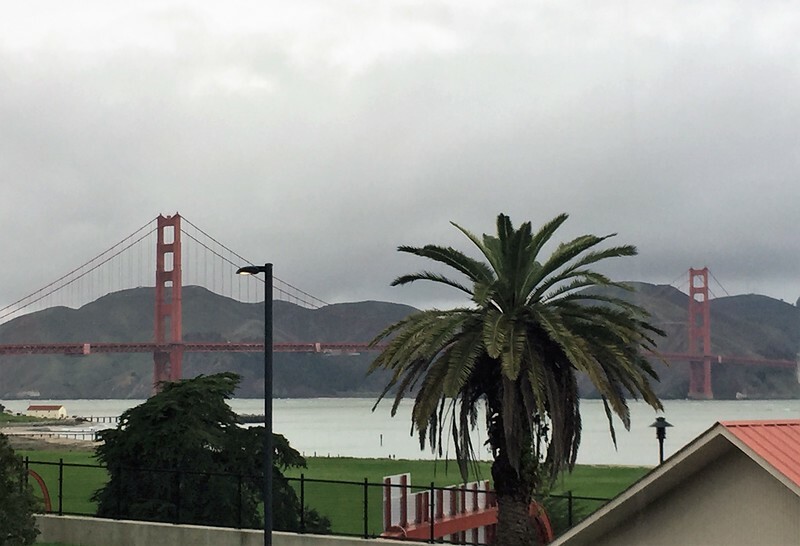 Why SF? Walt didn't have any strong ties to SF or do much work there did he? Just kinda puzzling why it's there instead of near Hollywood. To be honest, aside from seeing M5 industries, I'd never had any real interest in going to SF. I guess now I have 2 reasons. Good finish to the MK scavenger hunt. I think I went on Astro Orbiter as a kid but haven't taken my kids on it yet. The spaceship looks too small and cramped for me. 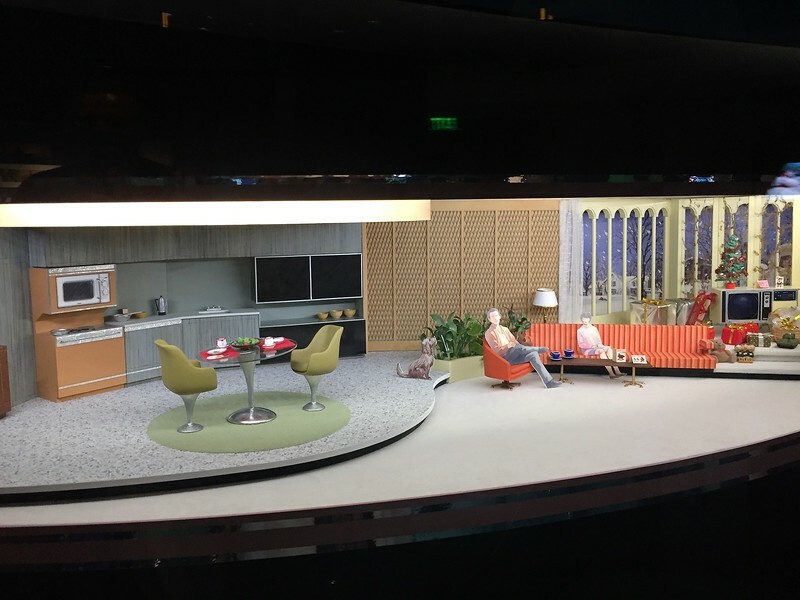 Very cool recap of the Family Museum. It sounds like it holds a wealth of information and memorabilia. That wall of cells that covers 15 seconds of animation...wow. That's just incredible. We did go on Astro Orbiter on our 2015 trip. It looked cool from the outside, and I had forgotten why I hadn't included it in our plans, so when the kids wanted to do it after Wishes, I was like, sure, why not? Then I realized why not, lol. The line moved sooo slowly, and when we finally did it, everyone was like, is that it??? So, I think that's a one and done for our family! Glad you got your cookies, even if you did have to make them yourself. I'm curious.... how many of you, My Dear Readers, have actually ridden the Astro Orbiter? Basically Dumbo but just higher up, I have always found it a hard pass because of the stupid long lines for it. Sure, a great view for 90 seconds, but I have better things to do for the hour it takes to get on them. I rode it once...when I was a kid. Never as an adult, for the exact same reason. Not worth the wait. Here is the witch that is undeniably the girl of your dreams, the one you want to take home to Mama, the one who would surely sing you the most beautiful lullabies as she plucked out your heart when she tucked you in at night. Ain't no way she's ever getting in my house, let alone my bedroom. I basically could throw up about 20% of my photos and satisfy this letter. Please don't throw up in this TR. Use the toilet. Okay, now… where was I? Right! On my couch with cookies stuffed in my face about to tell you all about the Disney Family Museum. Yes! Let me grab my notebook. Bags are checked and then you get your tickets. It’s not cheap, as adults are $25 and students $20. Great. I'll be up to my 8th mortgage or so. In a powerful way, it put into perspective how intensive the animation process is. The entire wall of cells is a mind-blowing 15 seconds of animation. Looks like my daughter's dream. So...I'll be keeping the kids away from there, then. I think that's the part I'm looking forward to seeing the most. 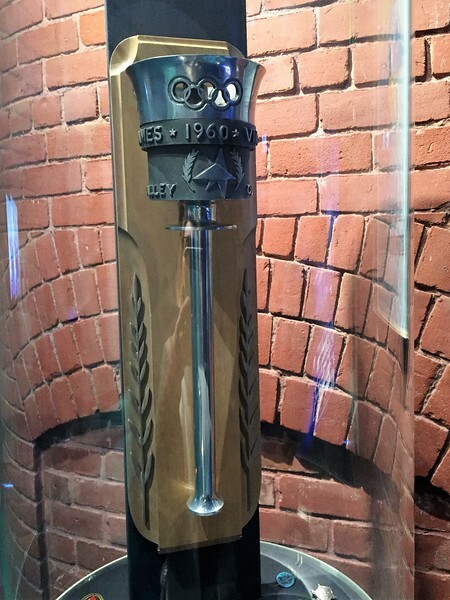 BUT, did you know that Disney artists did design a torch to be carried in the 1960 Olympics in Squaw Valley that all subsequent torches are based on now? Aw, come on! That totally breaks the mood. They are golden morsels of unhealthy deliciousness. Dipped in yellow mustard, they are nothing short of crack in a paper boat. Yum! They are wonderful...when done right. I was quite disappointed in my visit to Casey's in August. I will get to it in my TR eventually (it was on our last day) but the short story is the service was terrible and the nuggets were cold and soggy by the time we got them. I have. I think twice. Not on this latest trip though. I think 2014 was the last time I rode. I don't dislike it, but I don't particularly enjoy it either. I appreciate the views from up there. I felt the angle of the orbiter was a bit awkward and not very comfortable - it really slopes to the right and I felt squished. Who knew that of 4 parks, I'd be able to find a Xylophone in 3 of them! And yet, here is Xylophone #2 of 3. I would never have guessed there were any! I enjoyed the Peter Pan float too. Especially on a hot summer day. Isn't it great he's being so well loved on? I think they are asking if they can bring the zebra a pillow for his nap. Oh my, the museum. What can I say. Such an incredible place. I could spend quite a bit of time there. It's on my "blue sky" bucket list. Maybe one day. Just curious, have you ever heard the "Connecting With Walt" audio podcast? If you search for it and find the earliest shows, it deals with Walt's early years. I found it fascinating. I used to listen back when I travelled for work and had lots of time sitting in airports. I haven't listened in some time, but the shows I did catch were interesting. An excursion to plunk another something into the Bucket List Bucket. You have an actual bucket? Wow! Porcelain? Or a Coke for all I care. Maybe today a cold glass of milk would be best since I just baked some choco chip cookies. Mmmm... yes. Some things cry out for milk. Okay, now… where was I? Snarking down ooey gooey good cookies. Seriously, I’m already itching to go back so I can absorb some more. adults are $25 and students $20. I did. And yes it was. Love that one too. I wonder if they've done other "specialty" Oscars? Huh! So the name changed. Very interesting. 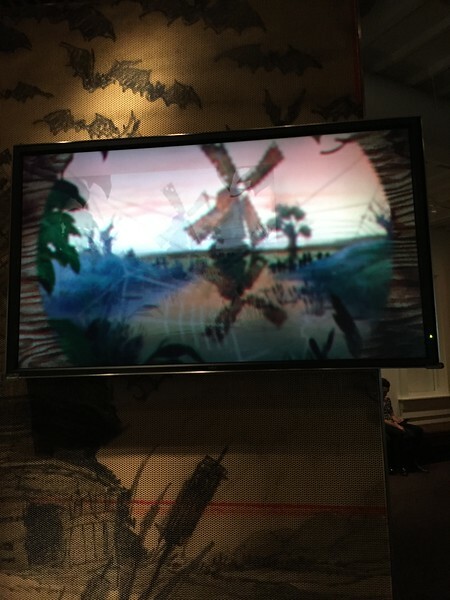 he introduced Alice’s Adventures where live action was mixed with animation. I've seen some of those. The entire wall of cells is a mind-blowing 15 seconds of animation. One of my favorites was of several women talking about what they thought it was like working in the paint department after the Studios in Burbank were built. Sorry, hard to follow all of that. 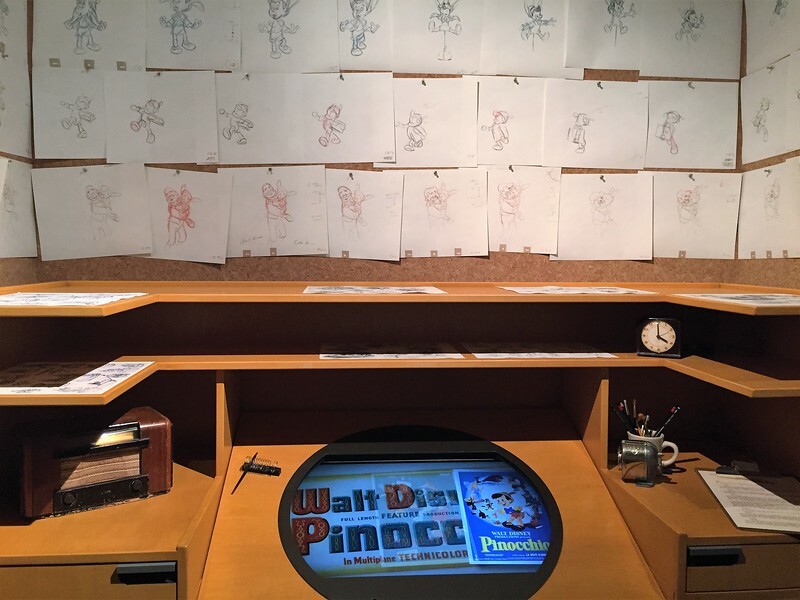 At one point, Walt Disney Co. ran into trouble with the Animator’s Union and his artists went on strike. Walt, being an incredibly patriotic man was heavily involved in war efforts. Did work for the war department I believe. Recruitment and propaganda stuff. Almost hidden away, and for obvious reason, was a very small poster of… brace yourself… Pin-ups for Servicemen done by Disney artists. Yup. That was condoned. And possibly encouraged. I so wish they hadn't taken that ride out. Much better than Under the Sea. The caboose is extra special because Walt hand built it himself at the Studio’s workshop. It was fun to take a mental stroll through it which brought up memories of park visits all along my childhood continuum- from my earliest memories of going with my grandma to my Grad Night, to working there as a CM. I spy a certain fairy. I see an E ticket! How much would you give to be able to go back in time and attend that party? Oh man!! the ski resort he tried to get up and running, but it never took off. Really! Huh. Imagine how fantastic that would be now! I found myself shedding a tear or two along with Mickey and Donald as we said good bye to Walt. The world loved him (except those who could have made more money off their acreage in the Florida swamp). I like the pin. Good choice. I'd like to. Maybe next year? Dipped in yellow mustard, they are nothing short of crack in a paper boat. Yum! Me I rode for the first time about 5 years ago, early one morning when I went to MK by myself. Line wasn't long at all. Now, I can do pretty much any roller coaster, go straight up, straight down, backwards, but I thought I was going to die on this Too open, too high!! We learned this on one of the MK tours, and a bit more about the whole thing! 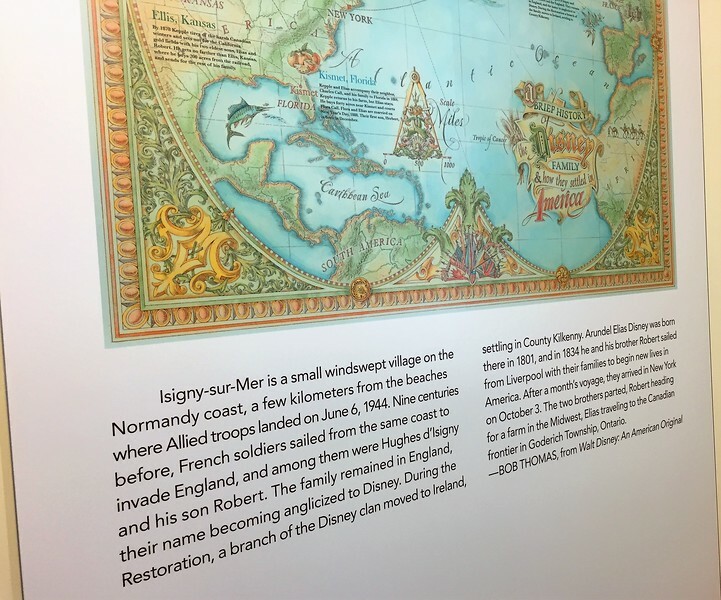 Thank you for sharing your experience at the museum, it does look like it's a wonderful set up with great information and displays, I'd love to get there someday! DonnaBeeGood and Steppesister like this. When my uncle was still alive, he (and his wife) came from Germany for a visit. "Ah! Das ist Mr. Bean!" And I can see that too. I need to slow down wayyyyy more. I'm a bit concerned now that should we meet again, you'll be wearing sandals or flip flops. I love summer. It's my favourite week of the year! I'd love to get a shot of the castle from up there. And there are a million details left that I didn't post because there are just that many. I think you will really, really love it. There is so much to do there. It'd be easy to spend a week and find things to do. We were only there 2 1/2 days, but this is the 2nd time in just a few years that we'd been there. That is a very good question and I have no idea of the answer.... ? Your guess is as good as mine! I think it'd be well worth your time. I've also visited the art museum and the Exploratorium as well and both, again, were absolutely incredible. Very worth every penny! Thanks! It was a fun one! Although, I think maybe the one in EPCOT was even moreso. You'll see why. I think the Astro wouldn't really be Evie's cup of tea. It's WAY up there and it kinda tilts outward as is goes. I wasn't a fan. Plus.... loooooooooooooooooooooooong wait. I also have a photo of Uptown Jewelers, which would have worked, but thought this one was more clever. There is so much stuffed in there. IMHO, too much to absorb in one go around. I'd love to go back again someday. I guess it's like Dumbo and any other ride. Once you're after... I dunno... 5? It's like, why? Cute but far too long a line for what it is. I ate 2 that night, 2 the next and the rest of the dozen I made are sitting on the kitchen counter. I froze the rest of the dough for another time. We're supposed to get snow all week, so many while I'm hunkered down I can make some more. I dunno, she has a pretty great mirror. I will admit that's where 90% of this TR belongs. Well, as long as you stick with PB&Js, you'll save yourself from a 9th. Send her to Cal Arts and maybe it'll come true. It's towards the end of the room that deals with the strike and Senate hearings stuff. Everything in the place was interesting, but this was so cool because it was such a different type of medium. Yeah, true. And like it or not, your kids will have to potty and you're gonna end up in it. OH man, that's too bad! Just yuck! Next time I get them, Imma gonna mix it up a bit and dip them in fake cheese sauce too. Looking forward to that update of yours... how could they mess up so badly? I've heard that more than once, and remember that feeling well. As a kid, I remember feeling like I was going to get dumped out of it. UGH! It went down pretty fast! Aww, there, there Mr. Zebra... what else can we do to make you more comfortable? It really is! There is a LOT to see in there. 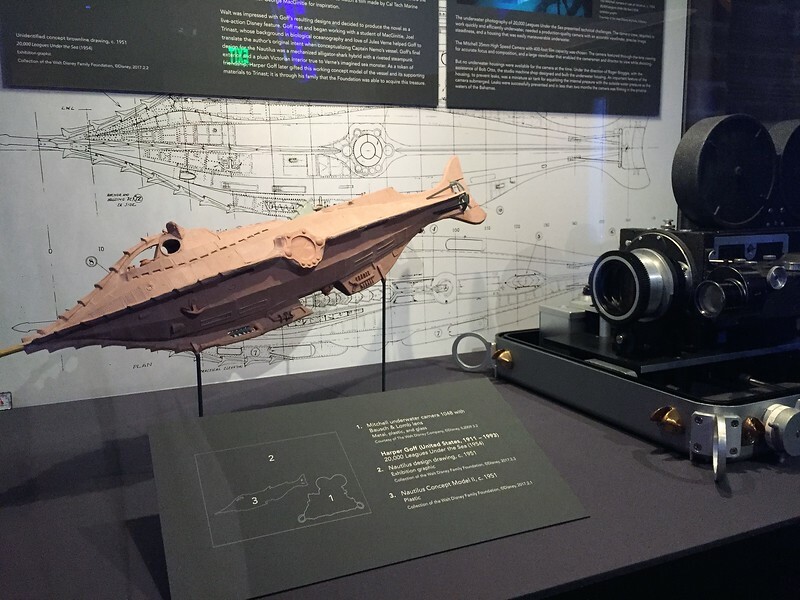 So many details and a good mix of stuff most people know with some super obscure facts few would. I will definitely check that podcast out! Sounds like it'd be right up my alley. What I really love is that the parks are still chock full of little hat tips and nods to Disney history if you what to look for. Well I hope you do too. It's called a toilet. Including the 0-24 month set. I thought for 3 hours of entertainment in San Fran it wasn't too bad. I think it's almost a work of art in its own right. Yes, that is what is shared and many examples are on display there. Me too!!! Agreed... MUCH better. It might be Cindy's castle in name, but I think this certain fairy rules the roost. It's a nice addition. I have an idea for making a display board for my pins... need to implement.